Arrived back safely at 15.40, not too much traffic about, except on the A3 where spray was quite a problem. To say that Inge is happy with both lamps is a definite understatement. If she were a dog her tail would still be wagging. We tried the Wisteria with 40 watt bulbs but decided it works better with 25 watt. We think the effect is better with less bright light. I will keep your cloth bags until we meet again. Thank you both for the excellent craftsmanship and also for the most enjoyable lunch, pity I could only enjoy one beer. We wish you and the family a very Merry Christmas and a Happy, Healthy and Prosperous New Year! to get them, they add so much to the total look of the lamp stand. starts modifying our shade to fit the Odyssey ring. take a picture with his digital camera and then I will send it to you. We were wondering what we need the copper wire for? The Lamp is a real triumph. a wisteria come to life in glass. is an artist of singular talent. X-RBL-Warning: (dialup.bl.kundenserver.de) This mail has been received from a dialup host. I just wanted you to know that I picked up my poppy lamp shade on Saturday from FedEx and that it was in perfect condition. The wooden box and packing material were intact and not one hint of damage. I am thrilled with the lamp. It is absolutely beautiful. I am very impressed with the the quality of your craftsmanship. It is just as you described. And the quality of the glass--the richness of the variegated colors, the textures, the air bubbles within the blue glass--it's a joy to look at and to touch. The veins of the leaves around the edges are also so beautiful. The subtle verdigris of the metal is tastefully done. I've not seen such glass on any of the lamps in stores here in New York. Actually, I should qualify that. I have not seen NEW lamps such as yours here in NY, but I have seen antique ones at the Metropoitan Museum and select antique stores. Beautiful lighting makes all the difference in the world in setting one's mood. And your lamp casts a beautiful glow. It's a pleasure to come home to. 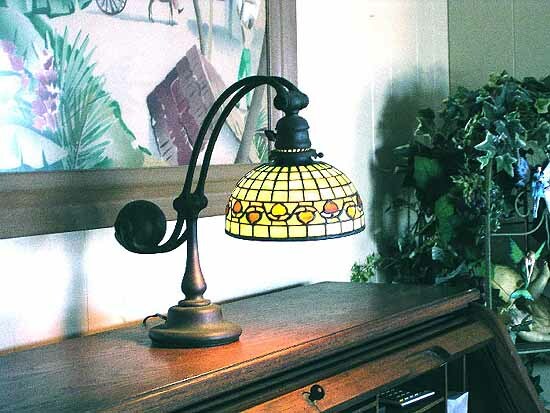 liked Tiffany lamps and is very happy indeed with the present. fabulous) and I am very impatient to have it in front of my eyes. We have an appointment on Sunday 20th. We plan to go to Brussels on Saturday, then the next day to Essen. I'll give you also the French plugs I bought for you. We can't wait to have the pleasure to meet you again. I thought you would enjoy this photograph of your spider lamp. 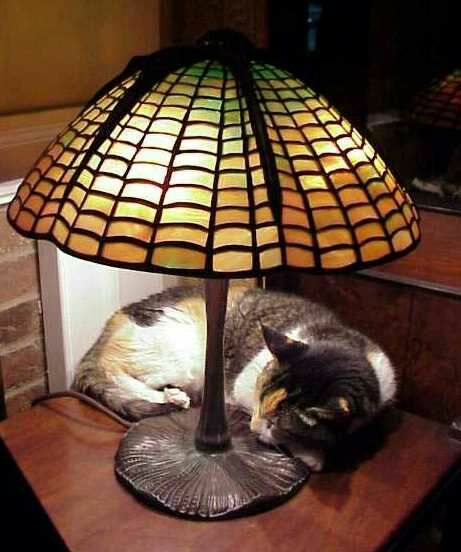 One of my cats --rosie--(1 of 2) has decided this lamp is an ideal area for sleep and an excellent source of heat. She is 22 years old, I got her in 1980 and at the rate she is going will outlive me. Is the 10" Azalea pictured on your site still available, if so what is the price. We received the lamps and were very pleased. They are beautiful and we appreciate all of your help. We hope to order more in the future. Thanks again. beautiful shade and my wife loves it (it is a birthday present for her). Thank you so much for the beautiful work! for all your efforts. Good luck with your next project! money anyway. And my neighbor paid the postman and I paid her. really know how to pack a lamp and shade; everything was perfect. I have the lamp togather now and it is everything and more than I expected. couldn't have done any better. ask him if he was an artist also. see them leave but it takes us both about 3 days to recoperate. wiring changed I'll take a picture of the two lamps and send them to you. You have a great time in Florida. as soon as I have. Ghislaine was extremely pleased about it and gives you all hercongratulations. how nice your work is. to assemble the lamp this weekend. about your trip to Orlando and England! customers - I would be more than happy for you to do so. I most certainly hope that you are not wasting your time with pulling of, or drilling around in, unappetizing teeth in ill-maintained mouths, in a fruitless attempt to stop or delay processes that will sooner or later lead to, and suffer, the inevitable destiny of being burned or buried! How much more rewarding is it to create timeless pieces of beauty that can be enjoyed by generations of enlightened - in the true sense of the word - people, even people who's time of ownership of naturally grown teeth has long been forgotten and who are now enjoying the piece of mind and freedom of fear for the consequences of paradentosis and retarding gums that only "thirds" can grant? Should, therefore, your motto not be "solder I must, drilling I may" ? As otherwise we might run into the precarlous and for all parties concerned unhappy situation' that I with my scratching up of scarce dollars might beat you to the finish which for you is the completion of the lamp! So, how are we getting along? Interested to hear progress report. Will stay three more days in this birthplace of civilization but can always be reached by email here or in Germany, not in US office next few weeks. Peter- Just a quick note to see how you are doing. of the value of the shipped item. I hope you enjoyed your vacation in the states. Jersey, so I should feel at home there. The lamp arrived today in perfect shape - it is FANTASTIC! we can get together (the offer to use our guest house stands ready). Subject: The lamp is magnificent!!! Fran and I unpacked the lamp the other evening and it was even more beautiful than we expected. Frankly it was the most beautiful lamp we have ever seen! It was a pleasure doing business with you (and we were even really impressed with the shipping container you made). By any chance do you have or can you make a hanging lamp similiar in size and shape of the grapevine lamp where the focused color is a cherry red? If so, we would be interested in buying one. Please let us know. Thanks again. You are a creative genus.